Waiting is frustrating, demoralising, aggravating, annoying, sometimes undignified and costly. The psychology and customer service impacts of waiting or queuing are important for the hospitality sector. In a three hour visit to a club, a member can spend collectively up to one hour waiting in one way or another. That’s one third of their time in the venue, waiting in line, waiting for a meal or waiting for payouts. It seems that we now offer another experience in our venues; not just food, beverages, entertainment and gaming; we can now add “waiting” to our core service offering. Most people don’t mind waiting for a period of time. It’s inevitable that your customers will wait for something. But how many of us think about how we manage our customers waiting time? Don’t avoid customers when you know the wait has been too long. To avoid the heightened state of distress, the number one rule is “more communication is better than too little”. Occupied time feels shorter than idle time. Boredom results from being attentive to the passage of time itself! It is common practice to hand out menus for customers to peruse while waiting in line. Some venues turn the waiting area into a bar, which also adds to revenue as well as occupying time. Use can be made of posters, reading material, TV screens to distract the attention away from the passage of time. Waiting is one of the most significant issues for Disney. So they turn the waiting period into a part of the entertainment experience. More recently, Disney has been a great exponent of the Lagniappe (pronounced L’nyip). It’s a small unexpected gift such as a key ring, a small toy or a 13th doughnut. People want to get started. One of the other virtues of handing out menus, providing a drinks bar and other methods of service-related time-fillers is that they convey the sense the ‘service has started; we know that you are here’. Anxiety makes waits seem longer. But dealing with the situation eases the anxiety. A great example of this is when airlines make on-board announcements that connecting flights are being held for a delayed flight or when movie theatre managers walk down the line reassuring patrons they will get in. Uncertain waits are longer than known waits. This is where your staff members need to demonstrate maturity to be able to communicate with customers who are obviously waiting and no doubt becoming agitated. Unexplained waits are longer than explained waits. By acknowledging the wait and explaining the situation, you diffuse the anxiety and provide the customer with a sense of understanding. Sizzler often does it well. It’s “Lagniappe” is the cheese toast. Recently while waiting in line at a Sizzlers store, waiters ventured down the line offering the free toast that I would have received at my table anyway. Unfair waits are longer than equitable waits. In many waiting situations, there is no visible order to the waiting line. 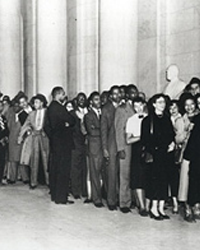 In situations such as waiting to be served at a bar, the level of anxiety demonstrated is high, and the group waiting is less a queue than a mob. Instead of being able to relax, each individual remains in a state of nervousness about whether their priority in the line is being preserved. Good bar attendants make a mental note of who is next. The attendant who comes into the bar late to help should ask the bar attendant who was next and not the customers. Solo waits feel longer than group waits. Whatever service organisations like clubs can do to promote the sense of group waiting rather than isolating each individual, will tend to increase the tolerance for waiting time. DWS believe that managing the waiting experience is such an important component of the whole customer experience. Managing queues and wait times is a core component within our Customer Service Training Package. For more information contact Geoff Wohlsen.